NAIROBI, Kenya, July 20, 2011 (ENS) – To raise public awareness of the impact of poaching on Africa’s elephants, the Lusaka Agreement Task Force and the Government of Kenya are burning five tonnes of seized ivory in Tsavo National Park on Wednesday. Lusaka Agreement Task Force and Kenya Wildlife Service officials Tuesday built an elaborate pile of elephant tusks with kerosene jets and a grill to fuel the fire. Today, a flaming torch wielded by President Mwai Kibaki ignited the pile. Most of the contraband ivory being burned – 335 tusks and 41,553 ivory signature stamps called hankos – was seized in Singapore in June 2002. DNA profiling to determine its probable origins identified the ivory as originating with elephants from Zambia, Malawi and Tanzania. It was exported from Lilongwe, Malawi. Elephants are listed as Endangered by the International Union for the Conservation of Nature. International trade in elephants or their parts is prohibited under the UN’s Convention on International Trade in Endangered Species, CITES. The treaty regulations allow the destruction of seized ivory since it has no legal commercial value. However, the price of illegal raw ivory is currently estimated to be in excess of $1,500 per kilo. Kenya is hosting the event as a party to the Lusaka Agreement on Co-operative Enforcement Operations Directed at Illegal Trade in Wild Fauna and Flora, a regional inter-governmental agreement on wildlife conservation that has established a Nairobi-based agency for fighting wildlife crime. The burning of contraband ivory is the first regional exercise of this kind and the third in Africa after Kenya’s in 1989 and Zambia’s in 1992. The ivory burning is the climax of the first-ever African Elephant Law Enforcement Day celebrations on the theme of fostering cooperation to combat elephant poaching and ivory trafficking in Africa. The day has been set aside to recognize the plight of the endangered African elephant, to celebrate its importance and to demonstrate solidarity with wildlife law enforcers as they strive to curtail elephant poaching and trade in illegal ivory, as well as other wildlife products. Celebrations include the first African Wildlife Law Enforcement Award and the launch of the African Elephant Law Enforcement Special Account, a fund for the support of law enforcement activities geared towards conserving the elephant. The African Wildlife Enforcement Monitoring System will be launched as part of the celebrations. By means of a regional database and applications software, officials will monitor enforcement efforts against trafficking and illegal trade in wildlife. The work of building a database and reporting mechanism at regional and national levels will be carried out jointly by UN agencies, national governments, private industries, civil society and research institutions. Last week, African diplomats based in Nairobi were asked to help their countries sign on to the Lusaka Agreement, joining the countries already fighting illegal wildlife trade. Lusaka Agreement Task Force Director Bonaventure Ebayi told the diplomats that jurisdiction restrictions are hindering efforts to combat cross-border environmental crime. He said that such restrictions mean wildlife crime offers high profits and minimal risk to criminal networks. “In the current era of global free trade, the ease of communication and movement of goods and money facilitate the operations of groups involved in environmental crime,” Ebayi said. “Despite the major contributions of ecosystem services to national and regional economies, the ecosystems continue to experience significant threats of environmental crimes that transcend national boundaries,” said Ebayi. Environmental crimes have been found to be linked other serious and organized crime, such as document fraud, corruption, possession and use of illegal weapons and money laundering. Data collated by Born Free reveals that in the last six months more than 10,500 kilos of ivory has been seized by customs and police officials. That is the last mortal remains of more than 1,700 elephants, said Travers. Seizures have been made in Thailand, Vietnam, Mozambique, China, Kenya and Portugal. One seizure in Guangxi Province, China in April 2011 included 707 elephant tusks, 32 ivory bracelets, and a rhino horn. 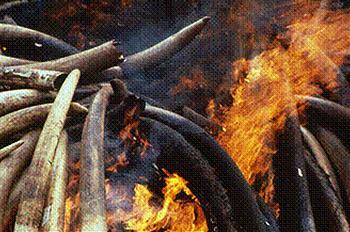 An international ivory trade ban was agreed by the Parties to CITES in October 1989. However, since then two “one-off” sales of stockpiled ivory from Southern Africa have taken place. The first sale to Japan in 1999 save over 50 tonnes sold for about $60 per kilo. More recently in 2008, China and Japan were authorized to buy over 100 tonnes, which sold for about $150 per kilo. 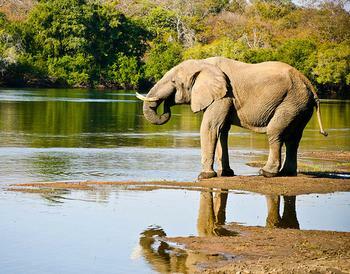 Despite warnings from conservationists, the CITES Standing Committee approved China as an ivory trading nation in 2008. China is where demand for ivory is greatest, driven by an increasingly wealthy middle class. “As more than a million Chinese nationals expand their footprint across the African Continent, building roads, mining, and carrying out timber extraction, they are widely implicated in ivory profiteering,” claims Born Free. 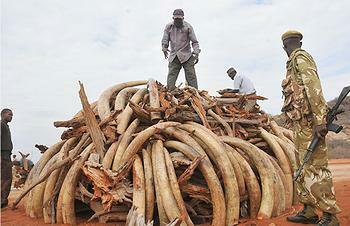 The Kenya Wildlife Service regularly reports the involvement of Chinese nationals in ivory seizures. The London-based nonprofit Environmental Investigation Agency called for all other illegal stockpiles to be burned.